What is the image in your minds eye when you think of a favorite spot to relax? What is it like? Quiet? Are you alone? Are you having a chat with a favorite friend? Is the location cool or warm? Is it remote without access to our high paced, electronics world? Or do you think watching a favorite movie to be that perfect place to relax? I suspect that perfect spot for relaxation is different for everyone. When visiting a National Park in the Southwest, I was intrigued to see this rock climber sitting on top of this spire, looking down on the world where visitors walked by below, while he appeared to be in quiet solitude in his remoteness. I was on a higher path and with my telephoto lens was able to capture him, first when climbing the spire and later when he sat on top. The primary sound was the cooing of doves and pigeons who had made their homes in crevices and nooks in the rock face. Most of the tourists were so mesmerized by the beautiful red rock formations that they too were generally silent or spoke softly to each other, like noise would somehow break the solemnity of their surrounds. I am a city girl who grew up in a medium sized city on the eastern coast of America. I'm rather uncoordinated and would never consider climbing a spire, that must have risen 200 feet or more off the ground, to find a solemn spot to relax. However I can understand how someone could find that the perfect spot. I guess I am a watcher of people and the many differences among us. I find people fascinating and love to capture them in what appears to be a place of pleasure so I can share their joy with the world. This man found a quiet, yet hidden place, in this terrain. I intentionally made him blend in with his surroundings, with only his blue clothing and blue climbers rope to help you discover and focus on him. 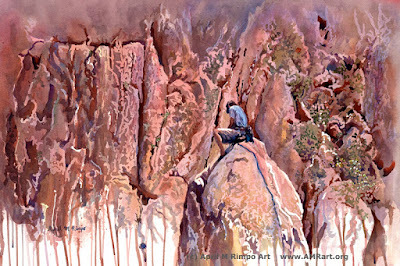 Although I used light and dark contrast to give shape to the rock forms along the cliff facing him on the other side of the spire, I muted the edges of the painting to portray the quiet of the environment and to help hold you inside. Some tenacious plants that clung to the cliff were included to help communicate the ruggedness of the environment where strength is need to survive. I felt this man too was another symbol of strength, even though he was in a relaxed pose, or maybe because he was in a relaxed pose. He portrays such confidence in his ability to climb and traverse the sheer rock faces. Please share your thoughts on your favorite place to relax. 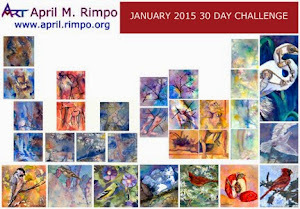 "Interested in learning more about April's art inspirations, tips about her painting process, or art business tidbits? Want to know when her art is in exhibits? Consider signing up for her twice-monthly email." I would have to say the mountains. Out in nature anywhere really. Or a chair in the corner.. with a good book. You are so right about the effect of a good book. I think when I am out on vacation with a camera in hand is another great relaxing time for me, no matter where I am.